Are you ready for this ? Of Course! This is the “First” of its kind celebration of the music genius of MonoNeon. Headed by SNARKY PUPPY’s multi-grammy–winning percussionduo of Robert “sput” Searight and Nate Werth, GHOST-NOTE is an explosion of sound. With an expansive roster ofnext-level musicians—representing members of Prince, Snoop Dogg, Erykah Badu,Herbie Hancock, Kendrick Lamar, Marcus Miller, Toto, Justin Timberlake,and more—the band is pushing funk music into the future, building on the uplifting, pioneering foundations laid out by the likes of James Brown and Sly& The Family Stone and infusing their fresh take with tastes of AFROBEAT, HIP-HOP, PSYCHEDELIA, WORLD FOLKLORE, and more. With the release of 2018’s swagism, GHOST-NOTE has made their mission clear. The album puts rhythm atthe forefront, with irresistible, heavy-hitting beats underlying the group’swild, rich music. 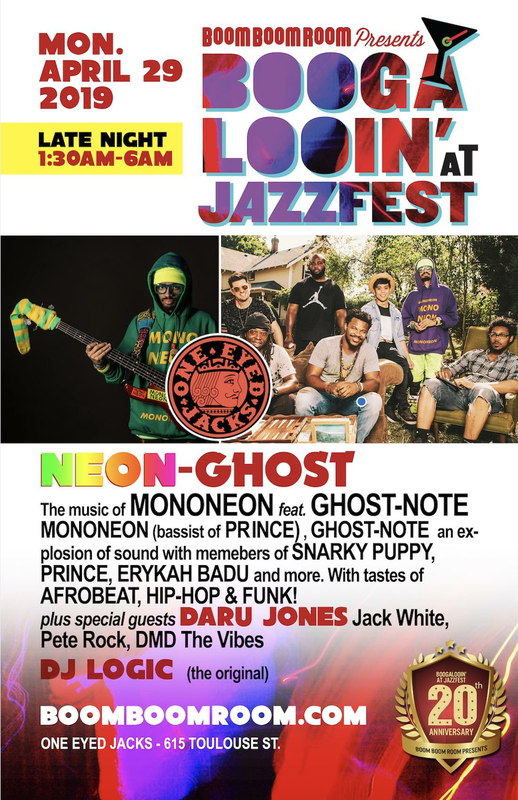 Featuring numerous guest collaborators, including Kamasi Washington, Karl Denson, Bobby Sparks, Nigel Hall, Taz, and others, swagism showcases the band’s stunning ability to meld and amplify sounds, ultimately adding toghost-note’s sharp, complex collaborations. Fearless, both in swagism’s sonic depth and conscious social commentary, the band easily translates this adventurousness in a live setting. GHOST-NOTE’s live performances are bold and in your face, with the group offering up none ofthe tight-laced pretenses frequently associated with the band’s Jazz roots. Focused on creating seductive danceable grooves and a contagious feel-good energy, each show is an opportunity to let loose and connect, for both fans and the musicians alike. Dywane Thomas, Jr. also known as MonoNeon, is an American bassist and experimental musician. He is known for his presence on YouTube playing bass guitar and known for being one of the last people to work with Prince. Thomas also played with Grammy Award-winning R&B artist, Ne-Yo, on his fourth studio album. He is a native of Memphis, Tennessee. While Thomas is right-handed, he plays left-handed upside down on a right-handed bass guitar, which allows him to use heavy string bending on the upper strings. Thomas’ slapping style/technique is unique because he is executing everything upside-down, but he still uses the thumb for slaps and fingers for pops. He also uses fingers and palm muting to create a warm, muffled timbre and have a little more control over the length of notes. In a free/improvisational setting, listeners may hear the use of Indian melodic inflections/embellishments in his playing, including the use of gamakas. Another attribute in Thomas’ playing style is the use of randomness and personal mistakes in performance, eventually moving the mistakes from meaningless to meaningful. Thomas’ overall playing style on bass can be described as “funky with unusual characteristics”. Even musicians like Marcus Miller have noticed his playing style. His musical background is heavily influenced by southern soul, blues and funk. In a Bass Player magazine interview, Miller mentioned Thomas as one of several “young bad cats” he has met on the scene. In 2009, Thomas was featured on the Gospel Chops Bass Sessionz Vol.1 project with Andrew Gouche, Hadrien Feraud, Damian Erskine, Janek Gwizdala, Anthony Nembhard, and Robert “Bubby” Lewis. In 2010, Thomas released several solo albums, including Aleatorick and Indeterminacy. Also in 2010, Thomas played bass on the Libra Scale album by Grammy Award-winning artist Ne-Yo, and the album Directions by Forest Won with Georgia Anne Muldrow. In 2012, Thomas joined David Fiuczynski and Planet Microjam. Also in 2012, he released his solo avant-garde album, Down-to-Earth Art as MonoNeon. In early 2013, Thomas released an album called Southern Visionary under the pseudonym MonoNeon. He also released an album entitled Uncle Curtis Answered The Lobster Telephone. MonoNeon performed with Sheri Jones-Moffett (2010 Grammy nominee) at the Recording Academy Chapter 40th Anniversary Celebration at Levitt Shell. MonoNeon teamed up with producer Kriswontwo to release an EP called WEON. July 2014, MonoNeon made his debut performance as the bassist for Screaming Headless Torsos at Jalisco Jazz Festival in Mexico. In 2015 MonoNeon began playing bass with Prince and his protégé, Judith Hill. Some of the live shows have been at Paisley Park. On 11 January 2016, Tidal released the track Ruff Enuff by MonoNeon, only four and a half days after its initial recording. The instrumental track features Prince as producer and on keyboards. The following day, the track was replaced with a vocal version with lead vocals on vocoder by Adrian Crutchfield. If the Grammy Award winning band, Snarky Puppy, was a heart, drummer Robert Sput Searight and percussionist Nate Werth serve as its explosive pulse. World renown for their artistic communication throughrhythm, this dynamic duo debuts their own project, expanding their percussive voice into a night of melody through innovative grooves and captivating artistry. Robert Sput Searight is one of the most influential drummers and producers in modern music. Hailing from a family of musicians in Dallas, Texas, Searight came up alongside artists like Erykah Badu, Norah Jones, and Roy Hargrove at the world-famous Booker T. Washington High School for the Performing Arts. He won a Grammy Award at age 18 with his own group, God’s Property, who changed the face of Gospel music with their debut album. Since then, he proven to be unparalleled in versatility as a drummer, keyboardist, and producer. Artists like Snoop Dogg, Erykah Badu, Celine Dion, Justin Timberlake, P Diddy, Timbaland, Myron Butler, and Kirk Franklin employ Searight’s talents regularly. As the undeniable secret weapon of Snarky Puppy, Nate Werth is both rooted in tradition and constantly innovating in the percussion world. His creative approach to sonic possibilities and rhythmic interplay has been integral to the sound of the group, and has earned the respect and support of percussion big-wigs like LP founder Martin Cohen. Having studied Indian, African, and Latin American traditions extensively abroad, Nate brings a unique sound palette to every musical environment, his deep sense ofgroove, passion and eclectic style, result in a distinct musical voice that propels him across musical borders. DJ Logic is a turntablist active primarily in nu-jazz/acid jazz and with jam bands. Kibler was born and raised in The Bronx. An early interest in hip hop led to his using the turntables, practicing often. He has performed as a guest of Ratdog, Medeski Martin & Wood. for more information about the show, ticket contests and special guests announcements!